The Transparency Project: Part 1 – Capital Improvement Program, What’s Inside? As promised, here is the first installment of the blog posts from our Transparency Project. See the introduction to the series here. 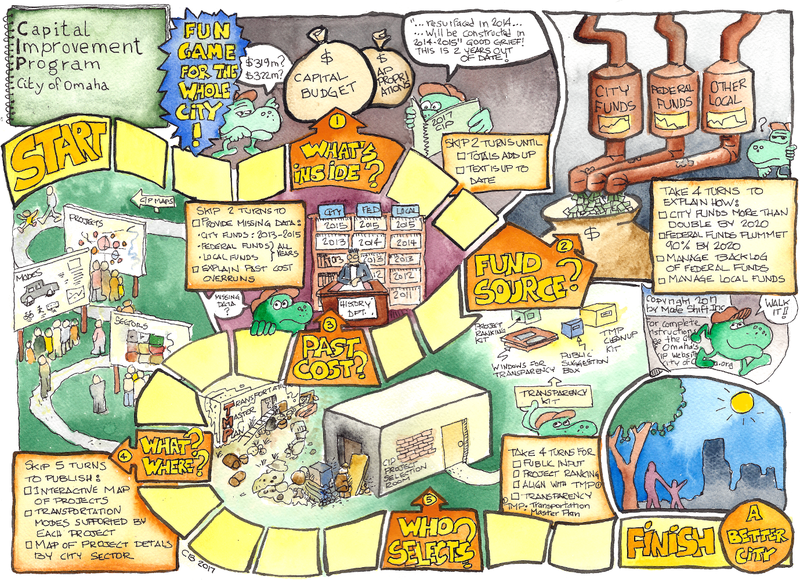 This blog post takes the reader into the basic content of the CIP and compares what it should be to what it is, the first step along the Mode Shift CIP Board Game. Transportation Capital Budget: $322 million. Or is it $319 million? In August 2016, the 2017-2022 CIP was approved by the City Council. The public copy of the CIP was published in October of 2016, and is available online. Each CIP is designated by the six year span of its capital budget. This six year span always starts the year after the CIP’s publication year. For example, the 2017-2022 CIP was published in 2016. So when we refer to the 2017 CIP, we refer to the CIP which covers the capital budget years 2017-2022, and was published in 2016. Wait, didn’t we just mention a different number? We said the transportation Capital Budget for 2017-2022 was $322 million. And it is. The totals on page 36 of the City Council approved CIP are missing over $3.3 million in the Capital Budget. The CIP approved by the Council in August 2016 had even more errors than the CIP published in October of 2016. The Transportation section of the CIP starts with 4 pages of narrative to explain the Program Formulation, Transportation Milestones, and Key Additions to the CIP. Up to the 2013-2018 CIP, the Program Formulation was updated each year, with a major re-write to introduce the Transportation Master Plan, which was adopted in 2012. Since then, the Program Formulation has stayed the same, stating that the CIP follows a Transportation Plan that “promotes a more balanced and efficient transportation system that incorporates the pedestrian, bicyclist and mass transit user while continuing to accommodate the auto”. We’ll address the Program Formulation in more detail in Transparency Blog 5 – Who Selects the Projects? This section highlights some of the key projects in the CIP. In the 2017 CIP, it is an exact copy of the “Key Additions” in the 2015 CIP, with the CIP’s year range updated to 2017-2022. Ironically, the “key project” showcased in the text was cancelled and not even in the 2017 CIP. The most significant issues listed in the table above are the missing expenditure data and the “flexibility” of the appropriations. Both of these issues will be discussed in detail in Transparency Blog 3 – “What does the past cost tell us?”. For now we’ll just note that the quality of the data for each project is poor. When Mode Shift asked City officials about the quality issues described above, they responded that they knew about them and had budgeted for some software to improve the CIP process. The CIPs totals don’t add up, the narrative is copied and pasted from year to year, project expenditures are missing, and the appropriations are shuffled without any accountability. Omaha deserves better. Not only should the quality of the CIP be improved, so should the quality of the City Council review prior to approving the CIP. Our next Blog post will look at the CIP’s sources of funds. Tomorrow we publish Part 2 about the source of funding for the CIP.